On May 26, HRH the Duke of York hosted the Pitch@Palace Promotion Dinner at the Windsor Castle. Ambassador Liu Xiaoming and his wife Madam Hu Pinghua, Inmarsat CEO Rupert Pearce, London Stock Exchange Group CEO Xavier R. Rolet, Royal Academy of Engineering Chief Executive Philip Greenish, HSBC Group Chief Executive Stuart Gulliver, Standard Chartered PLC Group CEO William Winters, Party Committee Secretary Gao Jian of School of Economics and Management of Tsinghua University, Ping An Insurance Chairman Ding Dang, JD.com CEO Liu Qiangdong and nearly a hundred Chinese and British entrepreneurs attended the dinner. 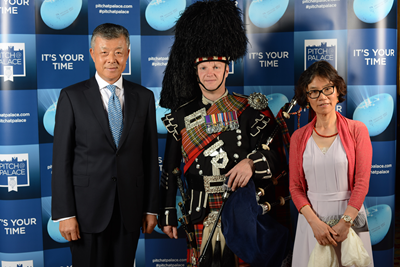 In his speech, Ambassador Liu extended his congratulations on the success of Pitch@Palace China 1.0 held in Beijing, and thanked the Duck of York for his tremendous contribution to advancing China-UK cooperation. Ambassador Liu said, "This year marks the 45th anniversary of Ambassadorial relations between China and the UK, and it is also a year for consolidating the "Golden Era" of China-UK relations. Bilateral exchanges and cooperation across the board have witnessed a number of highlights and produced fruitful outcomes." The Ambassador said he was convinced that there would be more gratifying outcomes for both China and Britain in the second half of this year, which would bring tangible benefits to the people of the two countries. Ambassador Liu noted that in a world of uncertainty with the launch of Brexit process and the snap election, it is the consensus of both China and Britain to keep the China-UK relations healthy and stable. And it is also the shared aspiration of the business communities to continue to advance China-UK business cooperation. He expressed the hope that the business communities of both countries will seize the opportunity provided by Pitch@Palace China to strengthen exchanges and deepen cooperation so as to deliver more "golden fruits" in this "Golden Era". The Duke of York said in his speech that the Pitch@Palace China 1.0 was successfully held in Beijing thanks to China's support. China-UK relationship is very important. President Xi Jinping's state visit to the UK has put the relations on a path of unprecedented development. Closer cooperation requires the people of the two countries to deepen mutual understanding, and in particular, the enterprises to have profound exchanges and cooperation. The Belt and Road Initiative, a strategic vision proposed by President Xi for global peace, prosperity and trade development, has received active response from all over the world. The Duck of York emphasised that he would like to use his own special influence to help Chinese entrepreneurs in their innovation and business development in the UK and the rest of the world. 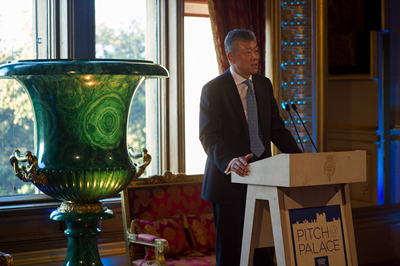 Pitch@Palace, a startup and an investment platform established by HRH the Duke of York in 2014, is committed to gathering influential entrepreneurs of various fields in the world and providing startup businesses with quality environment and resources. In the last three years, it has helped over 350 businesses projects and has established over 4,400 available value links around the world, some of which have now been purchased by Apple, Tweeter and other world renowned enterprises, and raised hundreds of millions of pounds of investment. In October 2016, this platform was launched in China and named as Pitch@Palace China. The first final competition of Pitch@Palace China took place in Beijing on May 22, 2017.